Since finishing second to Mr. Sipp in the 2014 International Blues Challenge, the Memphis-based Ghost Town Blues Band has proven time and time again that they’re a potent force in the music world today. If you’ve seen them in performance, you already know why. If you haven’t this spectacular live CD will give you a sample of one of the best and most dynamic bands touring today. Led by multi-instrumentalist and vocalist Matt Isbell, the seven-piece group of merrymakers begin every show by entering the venue in true New Orleans second-line style with horns blaring and drums and homemade rhythm instruments driving the beat. Mixing Memphis and Delta blues with Allman Brothers style jams, hip hop and much more, they were runners-up in the 2015 Blues Blast Music Awards as best blues band after winning top honors in that year’s International Songwriting Competition. Glance at this year’s Blues Blast nominations, and you’ll discover that this CD is in the running for Live Blues Recording and the group’s up for top band honors once again. Doubling on standard and cigar-box guitar – he runs Memphis Cigar Box Company in his spare time – as well as harmonica, Isbell possesses a raspy, gravel-soaked voice that belies his young age. He’s aided here by Taylor Orr on guitar with Matt Karner on bass and Preston McEwen on drums as well as Suavo Jones, a perpetual motion machine, on trombone, Kevin Houston on sax and Tim Stanek on keys, most of whom provide additional vocals. Recorded in front of an enthusiastic crowd at Lafayette’s Music Room in midtown Memphis, Backstage Pass opens with John Lennon and Paul McCartney’s “Come Together.” After a few bars of Hill Country slide guitar, the song races out of the gate atop a speedy, funky shuffle. Also propelled by the horns, it’s delivered in a style you’ve never heard it before. The six-plus minute jam evolves into a slowed down sampling of “Norwegian Wood” and erupts into a taste of Led Zeppelin’s “Whole Lotta Love” before ending on the “Wood” root with psychedelic overtones. A quartet of Isbell penned originals opens with the Memphis-style blues “Tip Of My Hat.” It’s a funky love song in which Matt states to the lady: “I’m gonna butter up your biscuits and keep you up all night.” Stanek sparkles on a mid-tune solo before yielding to the horns. The Southern rocker “Shine” keeps the feel going while providing the audience with a slight respite from the intense action that’s come before. The guitars are featured in the soulful jam “Givin’ It All Away” before the band erupts again for “Big Shirley.” Clearly a fan favorite, it’s an uptempo boogie woogie that describes a plus-sized lady who loves to dance. Stanek rips and runs on the keys before Isbell leads the group in sampling Zeppelin’s “Rock And Roll” to a James Brown-style, stop-time ending. The next 15 minutes are devoted to an interesting reinvention of the Allmans’ “Whipping Post” before a novel, thoroughly reworked 10-minute cover of Hughie “Piano” Smith’s Crescent City classic, “I Get High,” which features more stellar fretwork in addition to Jones delivering some of the most powerful horn lines in the business. The jam flows into a sampling of the Rolling Stones’ “You Can’t Always Get What You Want” with Suavo taking over for a potent rap before the band briefly returns to the “High” root. Isbell’s on harp for the loping original straight-ahead blues “One More Whiskey” before a cover of Robert Randolph’s “I Need More Love” brings the action to close. 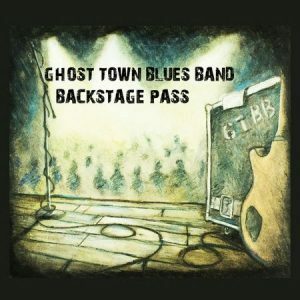 Available through CDBaby, Backstage Pass is an over-the-top pleaser that will leave you exhausted – just like you would have been in the crowd on the night that it was recorded. Strongly recommended.